Butler, L. K., Bohnemeyer, J. B., and Jaeger, T. F. to appear. Plural marking in Yucatec Maya at the syntax-processing interface. In Machicao y Priemer, A., Nolda, A. & Sioupi, A. (eds.) Zwischen Kern und Peripherie (Studia Grammatica, volume 75). Berlin: Akademie-Verlag. The paper discusses speakers’ production preferences in optional plural-marking on nouns and verbs in Yucatec. Yucatec plural-marking is typologically interesting in that there seem to be environments in which plural-marking on either or even both the noun and verb can be omitted without loss of plural meaning. Bohnemeyer, J. B., Butler, L. K., and Jaeger, T. F. submitted. Head-marking and agreement: Evidence from Yucatec Maya. This entry was posted in articles, Papers, Presentations, etc. and tagged field work, Juergen Bohnemeyer, Lindsay Butler, Maya, optional morphology, plural, production preferences, psycholinguistics, sentence production, Yucatec. We invite original and unpublished papers on psycholinguistic research on lesser-studied languages, for a special issue of Language and Cognitive Processes. Our purpose is to bring together researchers who are currently engaged in empirical research on language processing in typologically diverse languages, in order to establish the emerging field of cross-linguistic psycholinguistics as a cross-disciplinary research program. Both submissions that extend the empirical coverage of psycholinguistic theories (e.g., test whether supposedly universal processing mechanisms hold cross-linguistically) and submissions that revise and extend psycholinguistic and linguistic theory through quantitative data are welcome. The special issue will focus on the architecture and mechanisms underlying language processing (both comprehension and production) at the lexical and sentence level. This includes studies on phonological and morphological processing to the extent that they speak to the organization, representation, and processing of lexical units or the interaction of these processes with sentence processing. We seek behavioral, neurocognitive (e.g., ERP, fMRI), and quantitative corpus studies in any of these areas. This entry was posted in Papers, Presentations, etc., psycholinguistics in the field, workshop and tagged call for papers, field work, LCP, lexical processing, lexical production, psycholinguistics, sentence comprehension, sentence production, special issue, understudied languages. 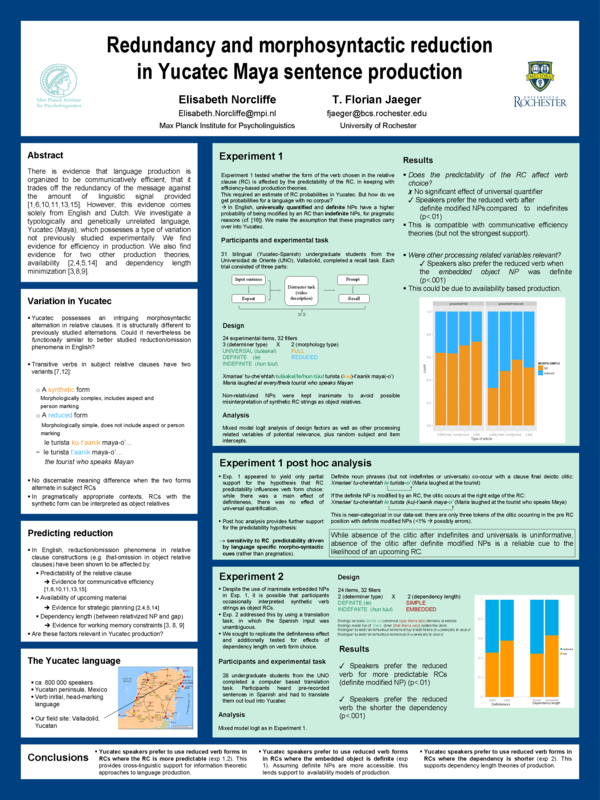 And here is one more poster on Yucatec, following Lindsay’s example. This is work by Lis Norcliffe, who just graduated from Stanford and join the MPI in Nijmegen. Her thesis work is on the (possibly resumptive) morphology discussed in this poster and the experiments were part of that thesis, too. You’ll find effects of definiteness and dependency length, which we investigated since they (in our view) provide evidence that this morphological reduction alternation is affected by both a preference for uniform information density and a preference for dependency minimization. Feedback welcome. This entry was posted in Papers, Presentations, etc., presentations and tagged CUNY, field work, Maya, morphology, Norcliffe, psycholinguistics, sentence production, uniform information density, Yucatec. 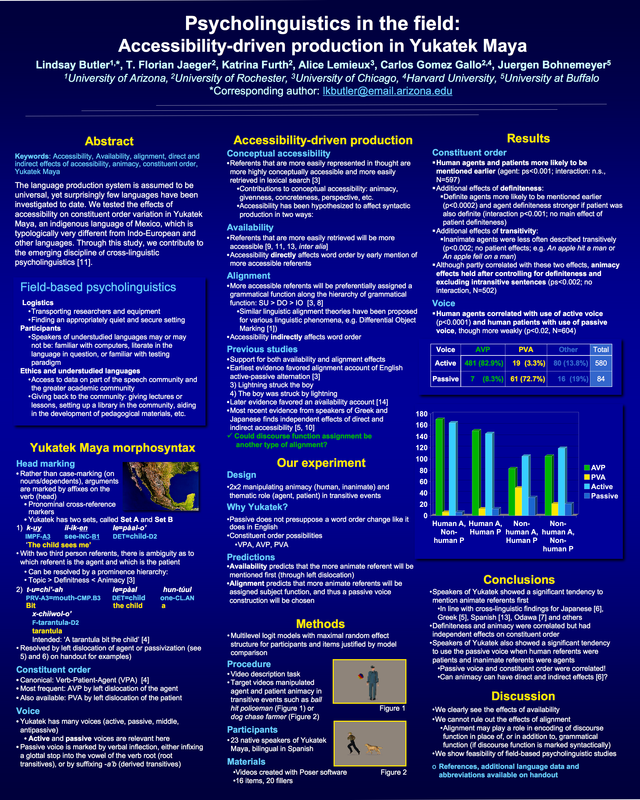 We presented the results of the animacy and accessibility study on Yucatec on March 18, 2010 at the CUNY Sentence Processing Conference in New York (see image below, or download the poster pdf file here: CUNY 2010 Sentence Processing poster Yucatec. See poster pdf file for additional data, abbreviations and references). We encountered a lot of support for our project and a lot of enthusiasm for continuing research. Soooooooo, stay tuned for more production studies on Yucatec to be carried out this summer. This entry was posted in presentations and tagged animacy, CUNY, field work, Maya, sentence production, word order, Yucatec. Good news! We’ve analyzed the previously mentioned experiment on animacy and word order in Yucatec. We coded animacy of the Agent and Patient referents (human, animal, inanimate), transitivity (transitive, intransitive) and voice (active, passive, other) of the verb. We also coded the definiteness of the Agent and Patient referents (definite, indefinite). Overall, Agent-Verb-Patient word order was strongly preferred (see Table 1). Moreover, human subjects were more likely to appear earlier in the sentence (ps<0.0001, interaction n.s., N=597), which is predicted by direct accessibility accounts. Human agents and patients were were more likely to be described as definite (ps<0.0002), and definite NPs showed a tendency to be mentioned earlier (agent: p<0.0001; patient: n.s., interaction p<0.0001). Still, the effect of animacy held independently (ps<0.002; interaction n.s.). The agent animacy effect was somewhat mediated by an effect on transitivity (whether participants described an event as e.g. an apple hitting a man or an apple falling on a man in that inanimate agents were less often described transitively (p<0.0001; no patient effects). The agent animacy effect remained significant even for transitive sentences (p<0.004; no interaction, N=502). In terms of the effects of voice, human agents correlated with the use of active voice (p<0.0001), and human patients correlated with the use of passive voice, though not at strongly (p<0.03, N=604). What does this mean? Good news! Interesting results. In Yucatec, the passive voice is encoded by verbal morphology. Passive voice does not presuppose or preclude a word order change. When a patient was human, sentences were more likely to be in the passive voice. Moreover, human patients were more likely to be mentioned earlier. So, we’ve seen the use of passive voice morphology and earlier mention with human patients. This entry was posted in Preliminary, Results and tagged field work, Maya, psycholinguistics, sentence production, video description, voice, word order, Yucatec. Heya. There are no results yet, but Katrina Housel, Carlos Gomez Gallo, and I just came back from the Valladolid, Mexico where we piloted and ran 3 studies on Yucatec and 4 studies on Mexican Spanish. This entry was posted in psycholinguistics in the field and tagged Bohnemeyer, cross-linguistic, field work, Gomez Gallo, Housel, Maya, Mexico, sentence production, Spanish, travel/motion, valladolid, Yucatec. The orange juice is still warm, the cafe con helado barely melted, the Mexican music that has been playing on repeat for the last couple of hours still swings mind-numbingly in my fried brain (it’s VERY hot and humid here), and here we are: letting you, dear reader [sic], know what the world is waiting for: is there probability-sensitive morphosyntactic production in Yucatec Mayan (similar to English, cf. Frank & Jaeger, 2008-CUNY, 2008-CogSci; Jaeger, 2006-thesis, 207-LSA; Levy & Jaeger, 2007; Wasow et al., in press)? This is a follow-up on a recent post. This entry was posted in Preliminary, psycholinguistics in the field, Results, Statistics & Methodology and tagged field work, Maya, Norcliffe, sentence production, variation, Yucatec.